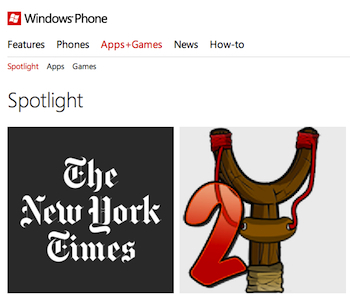 A report published by AllAboutWindowsPhone.com shows Microsoft’s Windows Phone Store now contains more than 125,000 applications, up from 100,000 at the beginning of May. The exact, official figure may be slightly lower, as according to the report, the amount of apps available depends on how you count them, as not all are live or available in all locations. Regardless, 125,000 is a respectable figure, but it’s a long way short of the 675,000 apps in its Google Play store and Apple’s 700,000 available in the iTunes App Store, a figure it confirmed during the iPad Mini event this week. Apparently, the Windows Phone Store is growing at the rate of around 215 apps per day, and there are 30,000 currently active developers too. Microsoft hasn’t confirmed these figures, but has the ideal opportunity to do so on October 29, when it will officially launch Windows Phone 8. While a growing app store is essential for the success of a mobile platform today, the rate of new apps being added has slowed over the past few months, which as the report points out, will be due to Windows Phone 8’s impending release. Looking at the “Items Added” chart, the difference is startling. In December last year — the store’s high point, just after the release of Windows Phone 7.5 Mango — more than 12,000 apps were added, but fast forward to July 2012 and less than 5,000 made their debut. August was much the same, as is October so far, but a spike to around 6,500 came in September. We know what you’re thinking, with just weeks to go before sparkly new Windows Phone 8 hardware goes on sale, why aren’t developers busily submitting new apps to capitalize on the rush? Microsoft has made things difficult in this area, as it still hasn’t released the Windows Phone 8 SDK to all developers, an essential piece of software to create and test new apps. It should make an appearance on October 29, right after Microsoft reveals everything it has held back about Windows Phone 8, so November and December should see a big increase in apps being submitted and released. At least, Microsoft better hope it does. During the launch of Windows Phone 8 on October 30, Microsoft’s Joe Belfiore said the official number of apps inside the Windows Phone Store was 120,000, and that 46 of the top 50 most popular mobile apps would be available on Windows Phone 8.